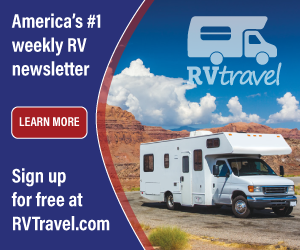 How can I get a metal (or tin-like) taste out of my RV’s water tank? I have always flushed the tank with clean water before every trip, then I fill it with clean water, but it still tastes bad. We live in an area where our water is supposedly the best right out the tap. Our RV is a Flair and we bought it new. Appreciate your answer to help us solve this foul problem. Bud, the most effective method of removing bacteria and contaminants such as trihalomethanes, (THMs), volatile organic contaminates (VOCs), pesticides, fungicides and metals such as lead is by using a point-of-use, POU, filtration system. I have realized good results from the products produced by Hydro Life. 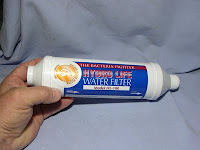 Available at most well-stocked RV accessory stores, Hydro Life has perfected a filtering media which employs carbon along with a patented media called KDF. KDF causes an electro-chemical reaction which neutralizes harmful chemicals and dangerous metals such as lead. To filter all water coming into the RV, use an in-line filter attached to the city water entry. Additionally, be sure to use an in-line filter on your fill hose when filling the fresh water tank. There are many models on the market, but be sure the filtration system satisfies the requirements of Standard 53: Drinking Water Treatment Units – Health Effects, as determined by NSF, a third party certifying agency. Though no official standard exists for POU filters, virtually all public health officials adopt the standards of the NSF.